You are currently browsing the tag archive for the ‘The Curious Case of Benjamin Button’ tag. “Where in God’s name did you come from? Who are you?” burst out Mr. Burton frantically. I originally intended to review Walter Scott’s Rob Roy for today, but given the season I have decided to review a series of fantastical stories over the next few days. This was inspired after I read today’s io9 article written by Michael Farrant complaining that there are no decent horror novels out there anymore. I also think I will track down John Lindqvist’s latest novel, as I was very impressed by the English translations of Let the Right One In and Handling the Undead. As to Benjamin Button well it is a very particular kind of adult fairy tale that treats of the deathless phrase ‘youth is wasted on the young’. Not quite Halloween you might say, but it is no less concerned with that most essential element of horror – our fear of dying. Roger Button is a young man of means living a respectable life in the city of Baltimore. Happily married and having the good fortune to be able to count on any number of relations belonging to the old families of the antebellum South, he is the very definition of a southern gentleman on the make. So it is an absolute scandal when having booked his wife into a fine modern hospital that the issue of their loins should prove to be Methuseleh himself! The family doctor and the attending staff are convinced that Mr Button has set out to fool them somehow and insist he remove the aged child from the grounds immediately. The infant, whose parents eventually give the name Benjamin, is bemused by all the fuss his arrival has caused. His relationship with his father is forever coloured by that sense of initial shock and embarrassment which his birth caused. Childhood proves to be quite a dull affair for the young/old Benjamin, who resembles an aged gentlemen of some sixty years or so, but finds himself forced to interact with insensible toy soldiers and playthings that do little to alleviate his boredom. Instead he studies dictionaries and encyclopedias in secret, as well as treating himself to a stolen cigar or two. He may be an infant, but he has the appetites and intelligence of a mature man, something Roger refuses to acknowledge. For the sake of the Button family’s social standing, Benjamin must continue to act like a child. Despite these efforts the myth of a strange child with the appearance of a wizened old man continues to grow. Roger fears he will die of embarrassment. As Benjamine continues to grow young he discovers his body becoming stronger, his wit more adept. He falls in love for the first time and weathers this further scandal of marrying a bride seemingly twenty years his junior with aplomb. Rejection by the admission’s board of Yale University fills him with a burning desire to revenge himself on that august establishment, but for the mean time he concentrates on running his father’s business. Together the two men share a life in their prime, both appearing to be brothers at fifty. However, despite his condition, Benjamin’s loved ones refused to understand how little control he has over his de-aging. It is not the done thing. For the duration of his existence it becomes clear he will be something of a family embarrassment. Fitzgerald writes this story in a manner of a wry and worldly children’s storybook. The social mores of Benjamin’s lifetime are treated with good humoured contempt, with the author and the infant Button both bemused at how people care so much about such silly things. For as he becomes younger it is made clear that Benjamin has the right of it, despite swimming against the current in such a seemingly rebellious manner. His ending becomes asurrender into soft thinking and soft flesh, Fitzgerald closing his tale with a flourish. 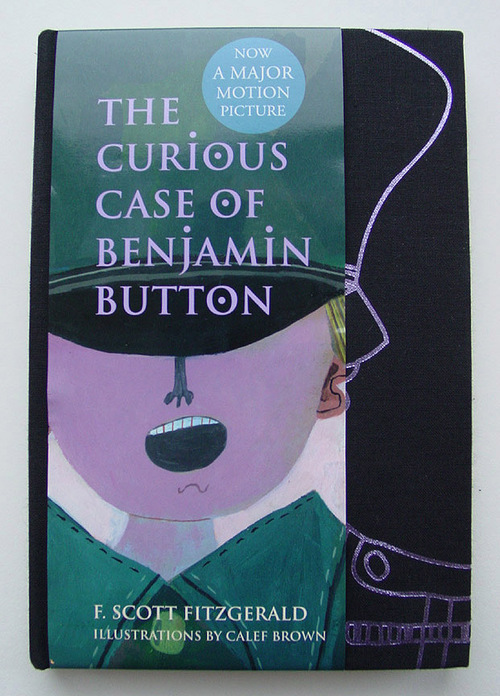 This edition carries a series of illustrations by Calef Brown that match the ironical nursery book tone of the prose. A wonderfully gentle fable about old age and death.